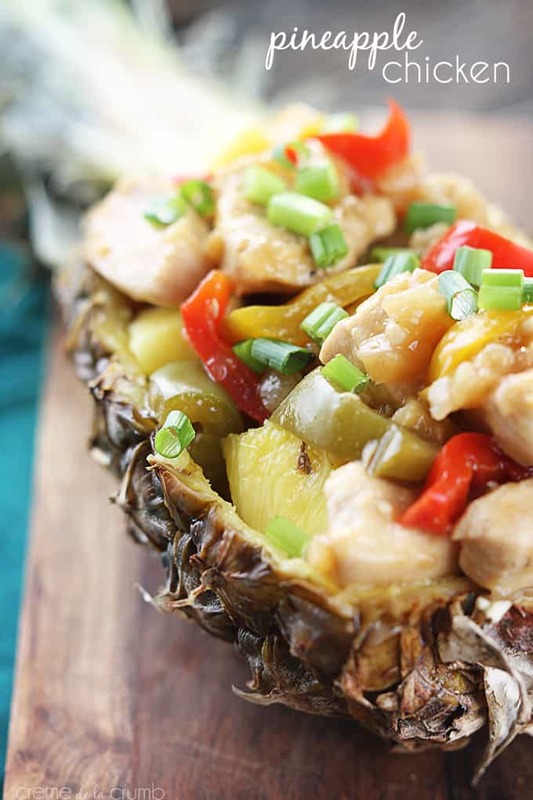 Pineapple Chicken – Juicy chicken served with peppers in a sweet and tangy pineapple sauce! Ready to eat in just 30 minutes! Remember how I told you that the Chinese restaurant I worked at through high school served some amazing Chinese dishes and some amazing not-so-Chinese-dishes? Well, this dish is reminiscent of one of those not-so-Chinese ones. 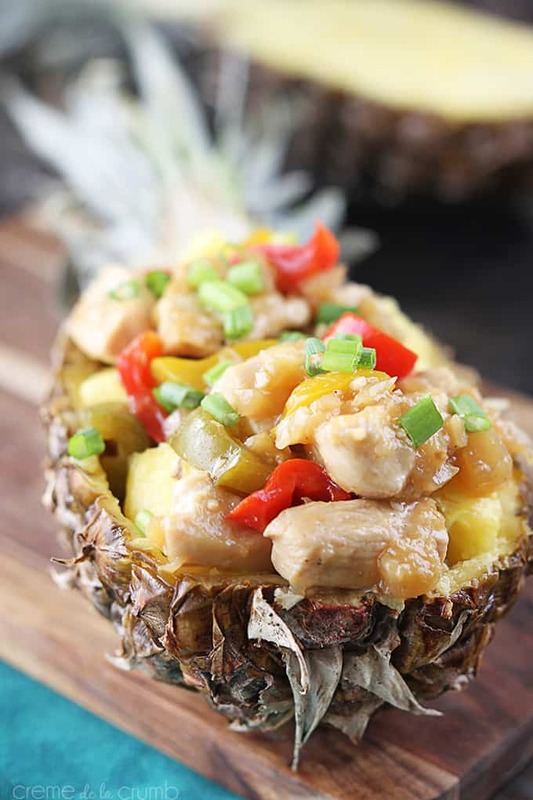 I don’t know how Chinese-y pineapple chicken is, as in I don’t know if they really eat Pineapple Chicken in China, because for some reason it reminds me more of an Pacific island dish. Regardless of it’s ethnic nature, it’s incredible. I remember the first time I saw chicken served in a pineapple at the restaurant. I honestly thought it was the coolest thing I’d ever seen in my life. And it is! I’m sure it’s been happening for years and years and yearrrrrs, but I think it’s genius. 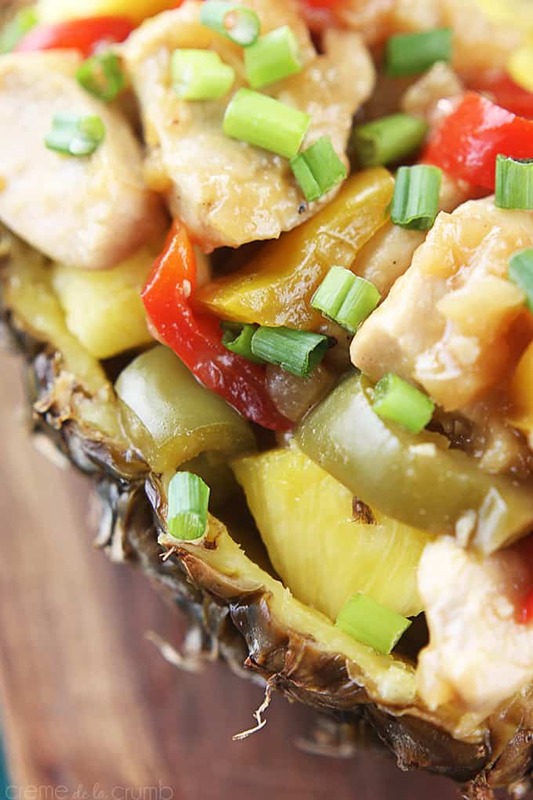 This Pineapple Chicken is sweet and salty and tangy and SO good! 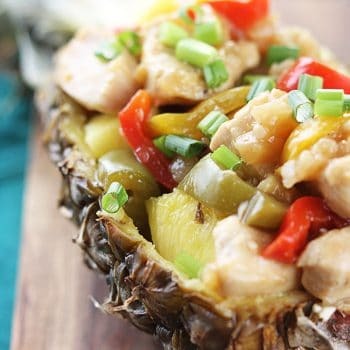 I love the pineapple flavor paired with peppers, and the chicken makes it a complete dish! I will make this chicken again and again, it’s amazing! If you have a fresh pineapple on hand, scoop it out and serve the dish right from the pineapple, it’ll take this delightful experience to a whole new level of wonderful. But if you don’t have a pineapple, still make this dish and enjoy every sweet and savory bite, you will love it! Juicy chicken served with peppers in a sweet and tangy pineapple sauce! Preheat a large pan or skillet over medium high heat and spray with cooking spray. Season chopped chicken with salt and pepper. When pan is hot add chicken and cook 5-10 minutes turning pieces over throughout to cook evenly. When chicken is cooked, place in a bowl and set aside. In a medium bowl whisk together crushed pineapple (with liquid), soy sauce, honey, ginger, garlic, garlic salt, onion salt, and chili powder. Add liquid to pan with chopped peppers, cover and simmer 5-8 minutes until peppers are slightly tender. Whisk together cold water and corn starch until dissolved, then add to cooking sauce. Stir a and allow to thicken a bit. Stir in cooked chicken and cook 1-2 minutes longer until chicken is heated. Serve hot with sliced green onions and sesame seeds over rice if desired.